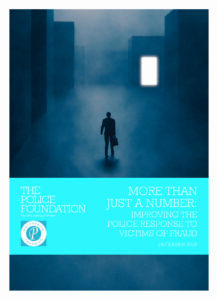 This report presents findings from the Police Foundation and Perpetuity Research’s two year research project which looked at the police response to fraud. Drawing on analysis of crime data and interviews with national and local practitioners, the research examines the nature of the fraud challenge, police enforcement, the experience of fraud victims and fraud prevention. It also presents a set of recommendations on how we can build a better system to tackle fraud.